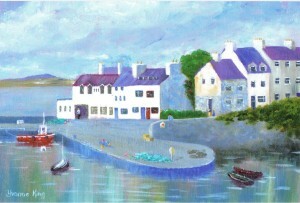 The above painting by Evyonne King, local artist Roundstone. Roundstone has an unusual history dating back for centuries past. The original Roundstone village is suggested by some to have been situated just past Inishnee Bridge, down at the sea on the road to Cashel. The remnants of this village are still there. Others Suggest that it was down by the old pier but based on memories from Martin Pat Conneely which were passed on to his family there appears to have been at least two as he believed that the original Roundstone Village was under the Hill. This would appear that there was a local village under the Hill and the fishing Village. Roundstone was/is a haven for fishermen especially in the past when fishing boats were not of the same standard of today. This was/is because of its deep sheltered inlet and pier. In fact this is one of the reasons the original Roundstone ‘sea’ Village was established by Scottish fishermen, who settled down with their families and inter married locally. Herring fishing was massive in this sea region at that time (middle of the 1700s approx). Roundstone was also important for goods delivery because of its deep Pier access for boats, which brought essential cargo for the west Connemara region. This was later transferred by primarily horse and cart throughout the region including at times Clifden, because its shallow inlet/Pier limited cargo boat delivery. Demographic occupiers: Ann Conneely has recently carried out an audio research into the occupiers of dwellings/businesses in Roundstone from the past. This was achieved by organising an informal discussion with three Roundstone natives in a ‘traditional kitchen format’ with three senior men from the Town = Paddy Mc Donagh (Yank) Michael John Ferron and Martin Conneely who apply their memories to the topic.